I was naturally up early, which I anticipated happening, so I made scrambled eggs with onions, cheese, and tomatoes out of the half dozen I bought yesterday. I was more hungry than I expected and ate two big egg burritos. I left the rest for the others at the house to enjoy. We all were packing up to head out this morning and I was extra careful to focus with four others moving around so not to leave anything. I’m most likely to leave something when there’s a group to distract me. 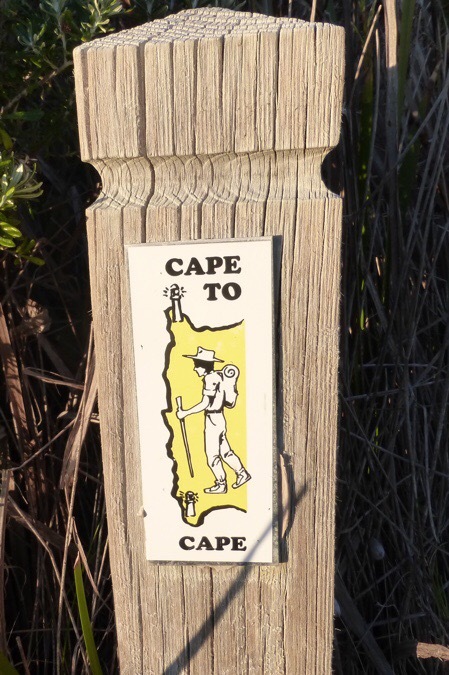 I had a short walk to the visitors center to catch my 8:30am bus ride to Augusta to begin the Cape To Cape Track. 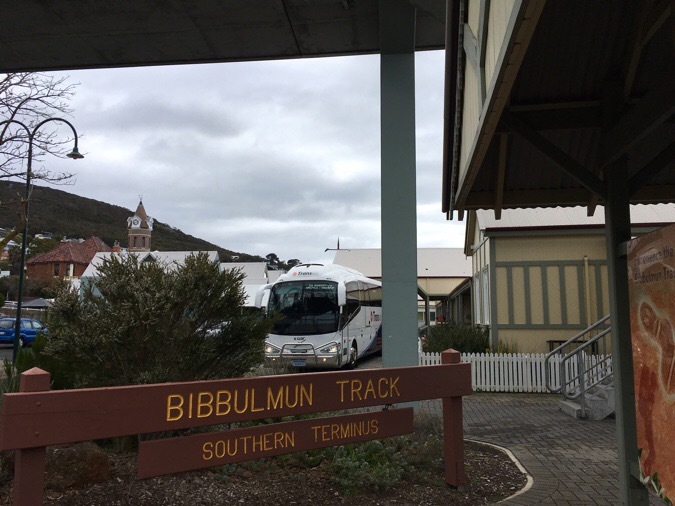 Fittingly, the bus picks up at the visitors center, right where the Bibbulmun’s Southern Terminus is located and where I was less than 24hrs prior. My bus to Augusta arriving behind the Southern Terminus of the Bib. A great deal of thought has gone into the route of Bibbulmun. The track wisely goes through many small towns to both make the trail more accessible and also increase tourism. More often than not, the route goes right by the visitors center of each town and encourages the hiker to go in, where there are a plethora of things to entice more tourism. Very, very smart. To make things even better, the bus I was on also hits many of these small towns. I saw many hikers that were out for a shorter period, not intending to complete an end-to-end, just cherry picking and deciding on a whim which section they will do or skip in the moment given the terrain and conditions. If it was raining where they were, they’d just jump on the bus and shuttle to another section. The trail makes this very simple as the bus usually stops next to the visitor centers and right next to the Bib. Yep, a very thought out trail that ties into a lot of tourism, very smart. I was looking forward to the northbound tour of half of what I’d just hiked since the C2C was situated west of the center of the Bib. If a direct bus existed from Albany to Augusta, it would be around 4hrs traveling northwest, but since it doesn’t exist, I have about 4hrs north and then 4hrs west. In middle was a 1hr layover in Burnbury and a late morning 40min break in another town where most got off for food. Surprisingly, the very large bus only had about a dozen people on it at a time (it is a Monday). 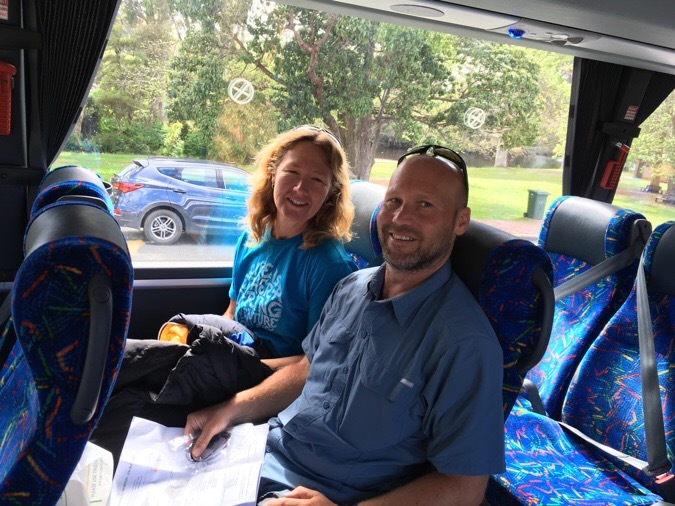 When the bus pulled up to Denmark, a couple got on that I saw my first night out of Walpole on Day 23. 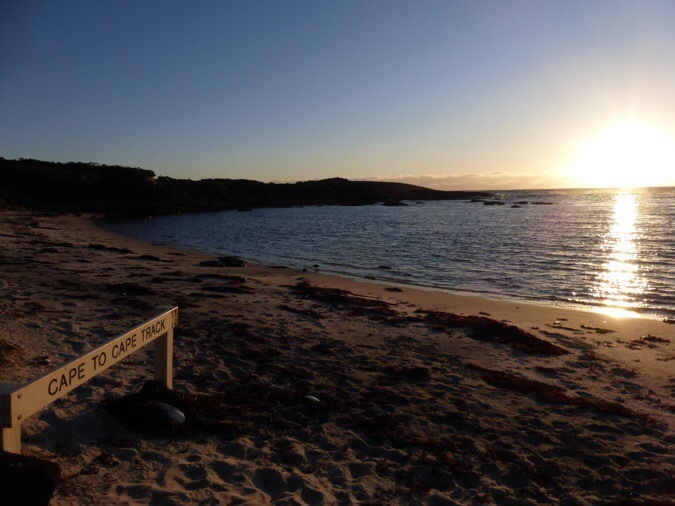 They did a section hike from Walpole to Denmark and were returning to Perth. Their names were Mark and Wendy and I was nice to talk to them a bit. Mark has done the C2C many times and was able to answer some of my questions. I had grand plans for today’s bus ride. It sounded so glorious to have 9hrs of downtime to relax, eat, sleep, get caught up on things, go over the guidebook, make phone calls, watch shows, etc. Well, that all quickly went to the wayside when I pretty immediately got motion sickness. The first half of the route was quite winding, and the bus was really bouncy and flew along the seemingly constantly turning road. I was so nauseated that I could barely do anything. I tried to sleep it off for a couple hours. Eating the big bag of bonus food I brought definitely wasn’t happening at all. When the bus stopped for 40mins in the morning, I ate a few Doritos to test the stomach and soon stopped. I was able to sew some things on my pants and holes in the mesh of my shoes, but the break finished before I did and I had to finish the last bit while the bus was moving. Terrible idea. 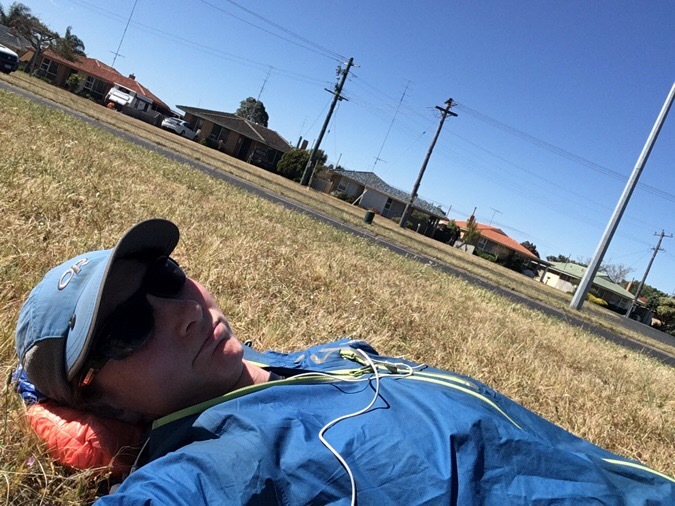 When the bus stopped from 2-3:15pm in Bunbury, I found some grass and just laid there willing the nausea to go away, knowing I needed to eat and drink. I’d hardly had a thing since breakfast. It waned a bit and I was able to eat the turkey wrap I’d made myself, a candy bar, and some more chips. I also watched an episode of Bloodline. Hoping to stop the nausea during the layover in Bunbury. Everything seemed better on the second half and I sat closer to the front of the bus. I was even able to watch the most recent Survivor episode. Less than an hour before Augusta, I mistakenly got up and walked to the back of the greatly swaying bus (I could barely stay upright with all the swaying) to use the bathroom (here they say toilet). It was terrible and I was super nauseated. 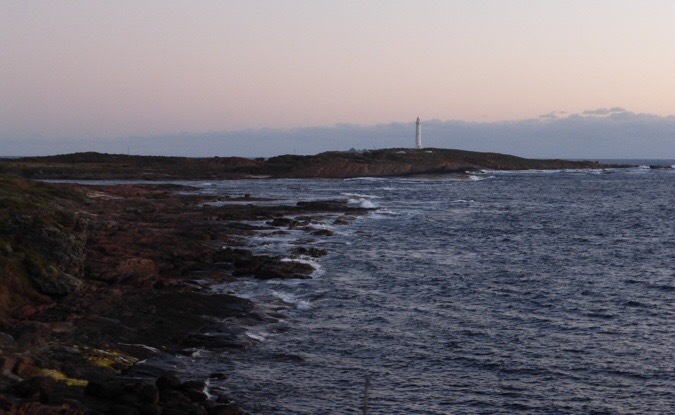 I returned to the front and met a woman named Janet sitting behind me who was from Augusta and willing to give me a ride to the Leeuwin Lighthouse, the start of the C2C less than 10mins from the bus stop. I had arranged to pay a taxi and this was great so I didn’t have to do that. Within a minute of talking to Janet, the nausea surged from all that I’d just done to walk to the toilet and back and I quickly excused myself and rushed back to the toilet where I barely made it in time to throw up all I’d eaten for the day. It’s one thing to throw up, but I never wish to vomit eggs and Doritos again! I controllably cleared everything in my body. I was only 45mins from Albany and almost made it! The nausea let up a bit and I made it through the rest of the bus ride that was thankfully more straight. Janet, and her husband Alex (I’m sorry if I got that name wrong) that picked her up at the bus stop, drove me out to Leeuwin Lighthouse. 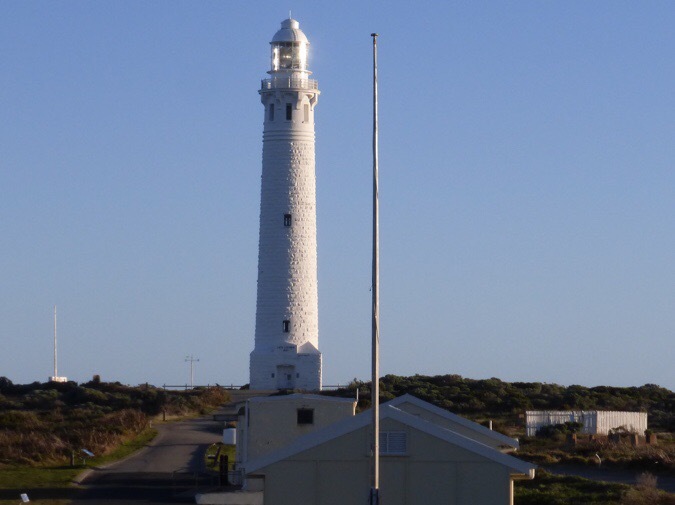 The C2C follows the coastline from Cape Leeuwin Lighthouse to Cape Naturaliste Lighthouse for 84mi/134km. It should take me just over four days to complete. The lighthouse was closed for the day, but I was able to still get photos as we approached and from the parking lot. 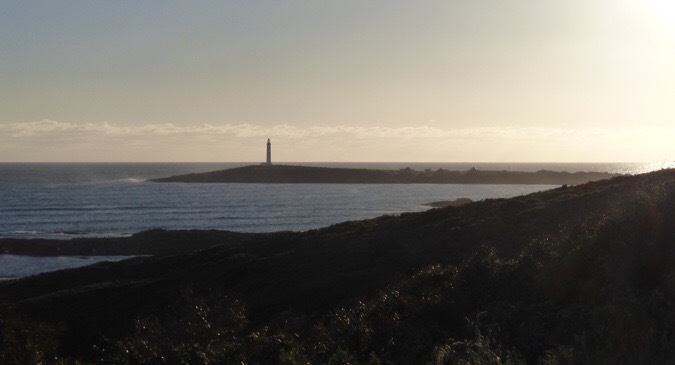 Janet pointed out that at the lighthouse was the point where the Indian Ocean met the South Pacific Ocean. THANK YOU Janet and Alex! At the start with Janet. I got started just after 6pm and knew I had just about an hour before it got dark. 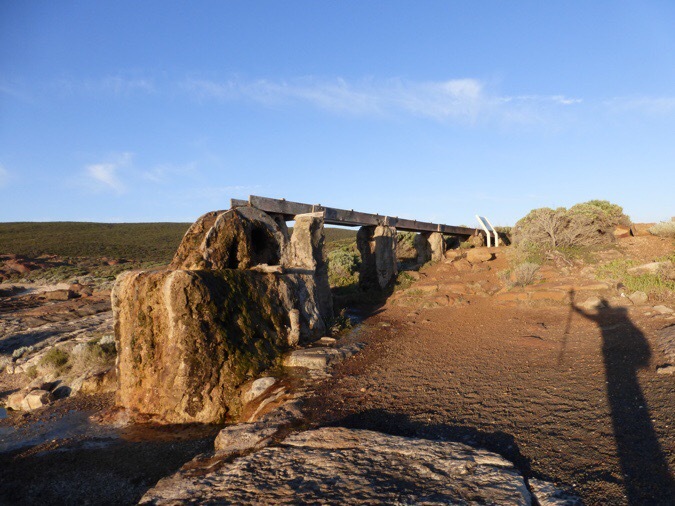 I had asked on the Bibbulmun Facebook Group if anyone had done the C2C and if there was camping opportunities in the first few kilometers of the trail. People were awesome with responses and I knew I had many options. This saved me the time and money of overnighting in Augusta and getting a morning taxi to the start. Old waterwheel that provided water to lighthouse workers many years ago. It was a perfect night and I got to see the sunset as I hiked over the brief rocky section of Quarry Bay. There were a couple parking lots and people out fishing or enjoying the sunset. I saw some exposed spots right on the beach, but I knew those could get quite gusty overnight and didn’t want to be too close to the tide. I also wanted to hike off the nausea if I could. 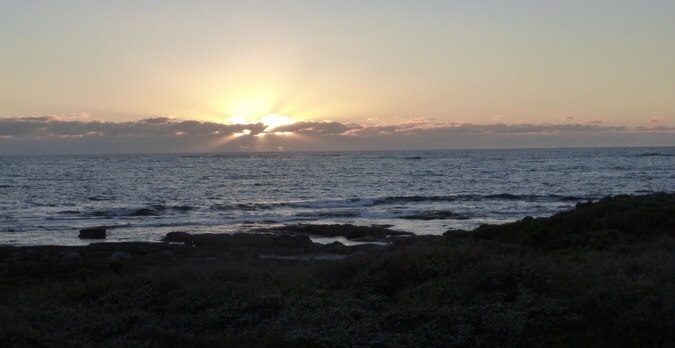 It was beautiful out and a great sunset over the Indian Ocean. I came across a sign for the C2C and had to get a better start photo than the gate of the lighthouse. I set the camera on my pack and set the 10sec timer for a selfie. In a random stroke of coincidence, I captured a seabird with its wings spread like my arms and I love it. It may be my favorite start photo of any trail I’ve done! 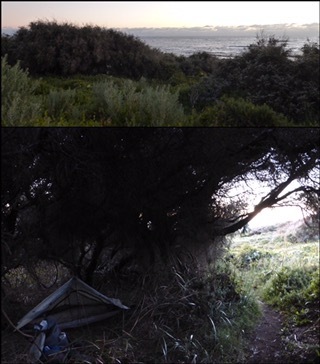 At 6:40pm, I came to a perfect sheltered camp spot that had been cleared under some brush right next to the trail and just above the ocean. It was too good to pass up! I was able to get everything setup before it got dark and took a photo of the lighthouse in the distance. My sheltered spot in the brush. I was able to eat a full dinner and was sure to drink plenty of water. The waves are calmly coming up just below me creating the perfect white noise to fall asleep. Temps are great and I don’t even need to close my storm doors for insulation. As I was laying here, it’s quite dark with a small moon, and I kept thinking I was seeing a flashlight. It was concerning at first until I realized it was the lighthouse! It was awesome to see it in the distance with all the stars out and the faint reflection of the ocean as the light swung around and panned across the water. Not a bad ending to a pretty rough day of travel. Good to be on solid ground and back to my best mode of transportation on my own two feet. Keep an eye out for whales Erin. You could be very lucky with the prolonged winter we have had. Coolest bird photo ever! Can’t wait to read your c2c! Wow -fabulous photo ! And what a lovely camping spot . Hopefully it won’t get tooo windy along the coast . I’ve sent you an email . Motion sickness -I can relate ! Can’t believe you’ve finished the end to end and are starting the c to c! It’s only 2 weeks since I saw your name in the register at Tom Rd campsite, and every hut to Beedleup! Well done, you are an inspiration Erin! The seagulls looks like a good omen to me.. I have followed your Bibbulmun Adventure all the way and am so glad to hear you made it through with no dramas. After nearly completing my second sectional end to end on the Bib, I’m really interested in you C2C Adventure. It’s something I’ve wanted to do for ages, and reading your blog will hopefully motivate me to get it done. You’d love it! Set relaxed days and take it in. Loving this trail so far! 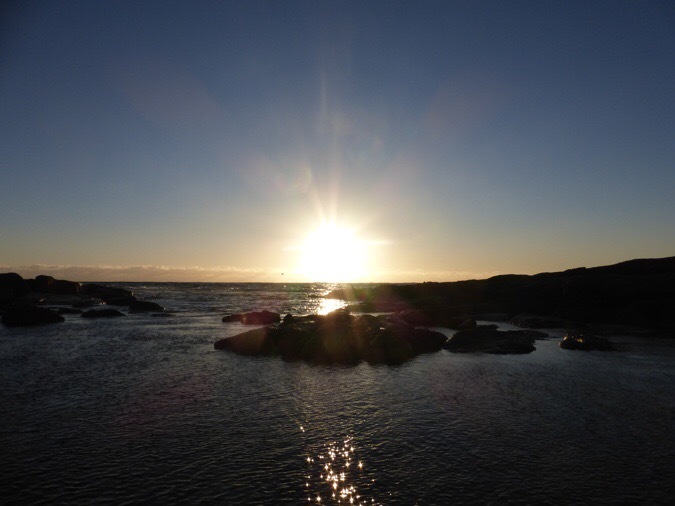 The lighthouse and seagull – all so cool! 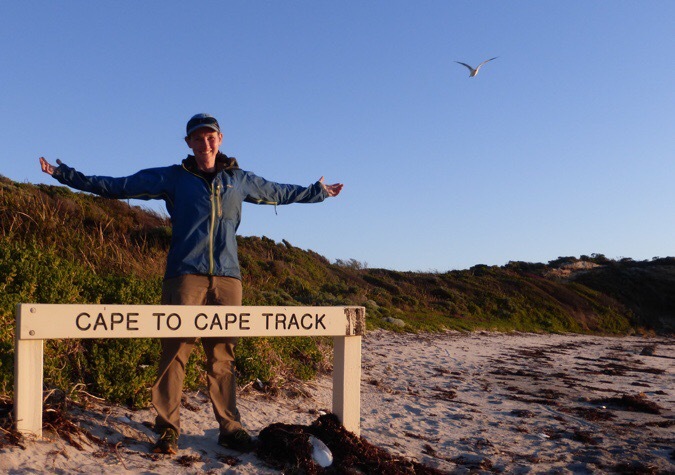 Hope the next few days are a good ending to your Australian tramping. Nausea – not a fun thing to deal with and glad you were able to walk it off. 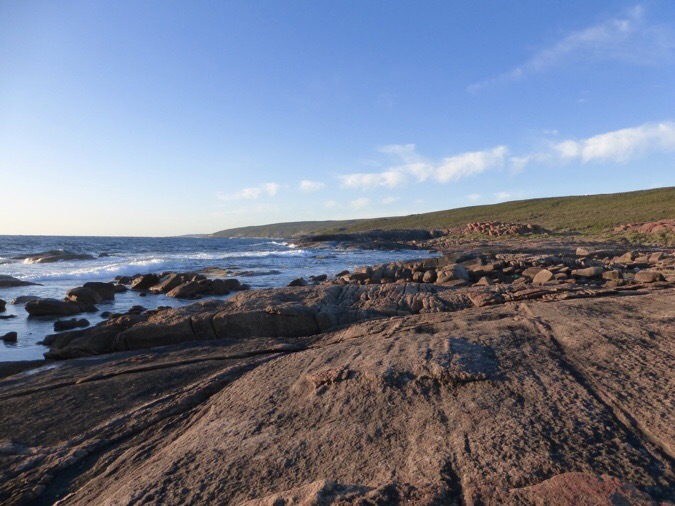 Beautiful views and a great camping spot – anxious to follow along the rest of the way!! “Good to be on solid ground and back to my best mode of transportation on my own two feet.” Loved that sentence. So much meaning there. Glad you are feeling better now. I agree. Your skill at encapsulating your day in blog form is superb. Hope this last trail is a real send-off to your Aussie trekking. These pictures are so pretty and make me feel like I’m there! I love it!! Thank you for sharing this with us!